'The Eye' was spotted by a film crew six months, while they were searching for a place to shoot a documentary. The plugged the coordinates 34°15'07.8'S 58°49'47.4"W and discovered an almost perfect spherical landmass floating in the middle of a tiny channel of water. The team flew to the remote area in order to see the island for themselves. 'The Eye' is about 130 yards in diameter and floats on its own axis. The surrounding channel of water is incredibly clear and cold - something totally unusual in the area. And the land on the island is solid, which is very different from the surrounding swampy marsh. The film crew has yet to state what 'The Eye' is but Scott C Waring from UFO Sightings Daily believes it is hiding an underwater alien base. They also discovered that the water is incredibly clear and cold (pictured), something totally unusual in the area. Now the team is seeking $50,000 via Kickstarter to support their next expedition, which they will to turn into a documentary film.The locals have their own take of the mysterious island that floats on its own axis – they believe 'a circle inside another circle represents God on Earth'. I have personally seen this particular video of the UFO discovered in a cave in AFGANISTAN some years ago, but now the VDEO has been taken off the net! "Ancient Flying Machine" found in Cave? World leaders rush to Afganistan. What is some information about Pushpak Vimana found in Afghanistan? What does a flying Vimana look like? How was Trisula, Sudharsana Chakra, and Puspaka Vimana formed? Is it true that US soldiers in Afghanistan had found a 5000 year old "VIMANA"? Well, something like that news came to the media in 2013 but they didn't extract that from the cave and instead some soldiers were lost at that place. I haven't searched means I can not say too much on this topic. UFO SIGHTINGS SINCE 2011 HAVE BEEN ESCALATING AT AN ALARMING RATE, & SEEN BY MANY THOUSANDS OF PEOPLE AROUND THE GLOBE! PLEASE WATCH THE FOLLOWING X-FILE TRAILER & COMMENTS, AND PASS IT ON TO AS MANY PEOPLE AS YOU CAN, WHILE YOU YET CAN! MAYBE THE X-FILE TRAILER IS WRONG OR MAYBE IT COULD HAPPEN AT A LATTER DATE, BUT PERSONALLY FROM ALL OF THE RESEARCH THAT I HAVE DONE IN MANY AREAS OVER THE YEARS, I THINK IT SOUNDS FAIRLY ACCURATE AND VERY PROBABLE! IF YOU HAVE BEEN FOLLOWING ALONG SINCE I STARTED THIS WEBSITE, ON 25TH SEPTEMBER 2014, THEN WHAT YOU SEE IN THE "X-FILE VIDEO CLIP" IS BLATANTLY ANNOUNCING WHAT THE ELITE ARE ABOUT TO DO. EVEN PUTTING IT BLATANTLY ON THE MAINSTREAM AS THEY HAVE BECOME SO COCKY & SO SURE OF THEMSELVES! IN MY OPINION, THE X-FILE VIDEO IS LIKE PUTTING SOME OF THE LAST PIECES OF A GIGANTIC MYSTERIOUS JIGSAW PUZZLE TOGETHER, TO BRING ON "THE NEW WORLD ORDER". YOU WILL FIND LOTS OF THE PIECES OF THIS GIGANTIC JIGSAW PUZZLE ON MY WEBSITE. THE 2ND VIDEO CALLED "UNHOLY COMMUNION" BY JOE JORDAN, IS TALKING ABOUT "ALIEN ABDUCTION" OF HUMAN BEINGS, WHICH I ALSO MENTIONED IN MY BOOK "OUT OF THE BOTTOMLESS PIT" - QUITE FASCINATING, AS WELL AS HORRIFIC AND SCARY, IF YOU DON'T KNOW JESUS AS YOUR PERSONAL SAVIOUR, AS JOE POINTS OUT IN THE VIDEO.! While at this moment is not possible to verify whether or not X-Files is being used to help awaken the masses or will eventually be used to lead the masses down the wrong path, we see this new (old) show is getting an awful lot of attention and topics that have generally only been covered by the alternative media are now seeing massive amounts of attention from people who may have never been exposed to them thanks to the X-Files. Will X-Files be used to lead people down ‘the wrong’ path as Mulder clearly believes they led him? 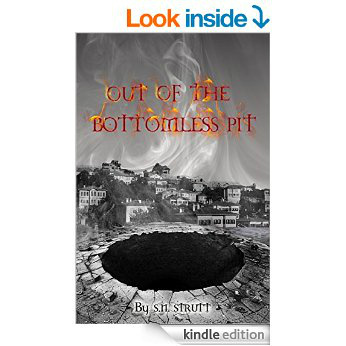 READ the new AMAZING and EXCITING PARANORMAL book by new author S N Strutt, who has himself been a witness on 3 different occasions to UFO sightings, as well as meeting the ominous and infamous MEN in BLACK. In what would spur the interest of UFO (unidentified flying objects) enthusiasts, a fleet of three identical giant spaceships were reportedly spotted passing the sun in an image captured by NASA's Solar and Heliospheric Observatory (SOHO). YouTube user, Streetcap1 (via Inquisitr) has uploaded a 56-second picture video that shows three identical UFOs passing the sun. "I am not going to keep on posting these as I want to do other stuff, however thought this one would be quite hard to dismiss as three CME's hitting the camera lens at the same time, although I could be wrong," said the description of the video. "This is amazing! 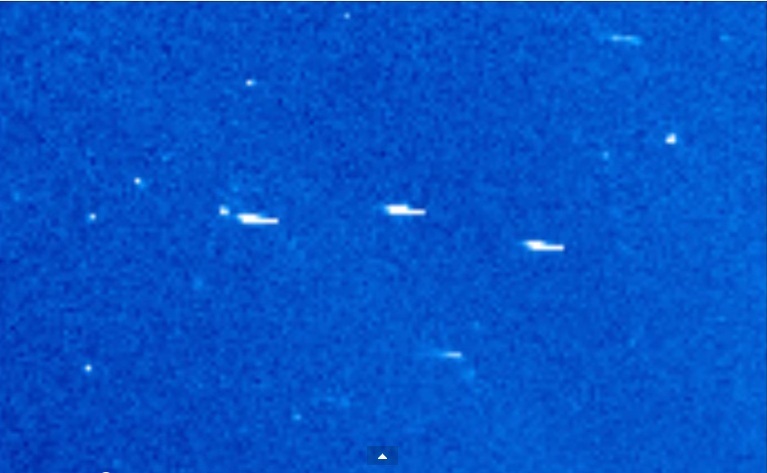 Streetcap1 of Youtube has caught a fleet of three big ships following one another in formation passing our sun. Now, when aliens start moving fleets, you know something big is up. This is a very rare occurrence and very important one," wrote Scott C Waring, editor of UFO Daily Sightings. Interestingly, conspiracy theorists have claimed that mysterious objects were spotted on NASA photo. It was reported a few weeks ago that three alien spaceships were spotted escaping the earth's atmosphere in the video captured from NASA live feed. The live feed from the International Space Station (ISS) was mysteriously cut by the space agency but not before three UFOs (unidentified flying objects) were caught flying pass the earth's atmosphere into the space, reported Mirror. Online UFO enthusiasts and conspiracy theorists have for long accused NASA of covering up evidence of existence of UFOs and massive alien structures on the dark far side of the Moon. Mars anomaly hunters have made similar claims about the planet Mars since NASA’s Opportunity and Curiosity rovers began sending to Earth photographs of the Martian terrain. The conviction shared widely in the online UFO and alien community is that NASA is hiding the evidence because the U.S. government has entered into secret alliances with certain alien races or species to share advanced technological knowledge. But UFO enthusiasts claim that the carefully guarded secrets of the U.S. government are being exposed in the 21st century era of the Internet where information is readily available and shared. Online UFOlogists have made claims ranging from ordinary and mundane to bizarre and even absurd claims of UFO and alien sightings linked with the International Space Station, the Moon, and Mars. But probably what has been the mainstay of the conviction among UFO enthusiasts that NASA is indeed hiding information about its knowledge of aliens and UFOs comes from testimonies and confessions by former top ranking civil and military officials. Some NASA employees have also made stunning disclosures that NASA is hiding information about its knowledge of alien UFOs and about astronauts having direct contact with aliens. THIS IS OFF FOX NEWS FOLKS! ONE OF OBAMA'S FORMER PILOTS! A REAL LIVE "UFO" ENCOUNTER ON MAINSTREAM NEWS! A "flying spaceship" (the red light) was spotted soaring around The Bronx Saturday night. It’s not the first time locals have said extraterrestrial immigrants boogied down from another galaxy to check out the neighborhood. Unusual lights in the sky were seen in the same area last year, and also in 2011, according to self-described “UFO journalist” Ryan Sprague. “I definitely think we’re dealing with anomalies that could potentially be nonhuman,” Sprague said. East 149th Street is close to La Guardia Airport, which could lead to “misidentifications,” Sprague conceded, though he said witnesses should not be discounted. Those who saw the orb on Saturday, and the one last May, echoed the same description — a light that “just sort of hovered, stationary, and then shot off in the blink of an eye,” he stressed. “The maneuvers these objects seem to be making don’t fit with any current technology that we’re aware of,” Sprague said. I had the photo analyzed by Daniel Wright the graphic artist and photoshop whiz who does our book covers, Stan Deyo an author with UFO expertise, and Richard Shaw the videographer and producer of the Watchers series with LA Marzulli. They all give educated opinions in the book, coming soon in May, but stay tuned here and at SkywatchTV for more details. The purple-colored disc-shaped object can be seen hovering in the sky near a construction site, but so far, there has been no official explanation for the object. According to Peru This Week, television show 'Alto al Crimen' - an investigative program aimed at preventing high level crime - was shooting an episode in the upscale Miraflores district of Lima on February 10 when they spotted the unusual object. The show's host, Lima Congressman Renzo Reggiardo, halted an interview in order to allow his camera operator to focus on the strange-looking purple object in the sky. Eyewitnesses reported seeing the object hovering over the city for up to two hours. Thousands of people have taken to social media to discuss what they think the mysterious purple object is and the video has already been viewed more than 100,000 times. The WEF (The Forum) is a Swiss non-profit foundation, based in Cologny, Geneva and describes itself as an independent international organization committed to improving the state of the world by engaging business, political, academic and other leaders of society to shape global, regional and industry agendas. The Forum is best known for its annual meeting in Davos, a mountain resort in Graubünden, in the eastern Alps region of Switzerland. The meeting brings together some 2,500 top business leaders, international political leaders, selected intellectuals and journalists to discuss the most pressing issues facing the world, including health and the environment. If Medvedev will be able to convince the Obama regime to tell the truth about UFO and aliens at the WEF this week it is not in our knowing. What is in our knowing, though, is that with or without the US, the Kremlin will surely begin the process of telling the truth about that which we already know to be true. In addition to the alien disclosure Russia threatened the US with smoking gun satellite photos proving 9/11 was an inside job just yesterday. February 10, 2015 - Pravda released a SHOCKING report that has the Illuminati running the United States literally freaking out in fear since they’ve been caught over 9/11! Putin is now threatening to release smoking gun satellite photos that prove 9/11 was a false flag completed by components of our government just as he released the smoking gun satellite videos proving the US backed Kiev government shot down MH-13 when the Fake News told us for months that Russia shot it down! This is all lies of course and recently as reported by VeteransToday, John McCain just admitted that Ukraine is guilty of war crimes! He admitted that Kiev used cluster bombs on Civilians but said they had to simply because we wouldn’t give them the GPS weapons they wanted! How’s that for some twisted logic! What most Americans don’t recognize that watch the fake News and support the fake “tip of the spear” alternative media is that Russia has already provided smoking gun proof on who did 9/11 and this has only been discussed extensively on Veterans Today and Veterans Today Radio shows. Under you will hear the radio broadcast that first broke the story. Please share it with everyone if you want justice! You have no thought what you don’t know about 9/11 unless you hear this interview and study every thing by Gordon Duff and the rest of US Intelligence that writes for VT. This information was given to CNN also but they sat on it and only VT published and verified it all with other sources in the US Government and French Intelligence. 9/11 was a nuclear attack, there had been no airplanes involved. No plane hit the towers or the Pentagon. The Pentagon was hit with a cruise missile that hit directly on the conference space where the Capable Danger investigative group at the Pentagon have been told to go correct before the missile hit! No planes hit the towers, it was all CGI trickery and holograms that we’ve had for decades. Bear in mind, all of this info on 9/11 ONLY came out on VeteransToday so if you are spreading stories kind option media sites that censor VeteransToday, you’re really assisting the enemy! Now Putin is openly threatening the US at delivering satellite images of what most men and women already know – that 9/11 was an inside job and members of the US Government planned and executed the attack along with members of another government explained in the video above. Here’s the Google translation of the following story in Pravda! American specialists believe that regardless of the reality that relations among the US and Russia reached the worst point since the Cold War, Putin delivered until Obama only minor troubles. Analysts believe that this “calm just before the storm.” Putin is going to hit once, but he’s going to hit hard. Russia is preparing the release of evidence of the involvement of the US government and intelligence services to the September 11 attacks. In the list of evidence consists of satellite photos, the site secretsofthefed. com. Published material can prove malice government towards the individuals of the US and the successful manipulation of public opinion. US government planned to attack, but spent her proxy. So that an attack on America and the men and women of the United States looked like an act of aggression of international terrorism. The motive for deception and murder its personal citizens served as US oil interests in the Middle East state corporations. Why Are UFO's & Alien Life Suddenly Being Discussed In The Mainstream? Is the government and media gearing up for disclosure? The amount of mainstream coverage extraterrestrials are getting is increasing, could the press and the government be prepping us for disclosure? There was a time when the mainstream press would only cover aliens and UFO’s if it were a satirical piece, after all aliens were relegated to the realm of tin foil hats and science fiction. Recently however more and more publications are talking about the possibility of alien life like it is becoming science fact. This open discussion of these topics in publications such as The Guardian, The Daily Mail, Metro, The Huffington Post and even Sky News to name a few. The headlines openly discuss the possibilities of alien life and the vastness of space and the likelihood we will find life. NASA have been have made countless discoveries in recent years that indicate that planets in our own solar system were once alive and had water flowing on the surface. The Telegraph in 2011 would run headlines such as ‘Alien Life Deemed Impossible’. Professor Brian Cox who holds great sway over mainstream audiences when it comes to space ad the unknown also stated that alien life was impossible. Last December former MoD Nick Pope discusses the possibility that the government was prepping us for alien disclosure through our news and media outlets, by openly discussing these subjects and slowly introducing the concept that it may be true over time you can condition the public to accept the news without fear. The UK government is also set to declassify more of its “X Files” and make them publicly available on the National Archives in late 2015. Nick Pope said, “This is a hugely embarrassing situation for the government. "Last summer they told the media and the public that yes, this was absolutely all the UFO files and there was a big fanfare about this being the end of a five year programme to declassify and release the entire archive. Now they say, 'Oh, wait a minute, we've found a whole bunch of further UFO files'”. The total count of confirmed planets discovered by the Kepler Telescope is now at 1004, including two earthlike planets. This combination of declassifying government documents and widespread media coverage of aliens and UFO’s seem to be gearing us up to accept they exist on mass. Even today (Jan 16) the mainstream press are publishing article about the search of life sustaining planets and how thousands more have been dicovered. It was just the other week that NASA were saying they have thousands of life sustaining planet candidats. The concept of alien life is without doubt slowly being introduced to the public consciousness. What do you think, are we being prepped for a big disclousure in 2015? Dr. Jacques Vallee, a French-American computer specialist with a background in astrophysics, once served as consultant to NASA's Mars Map project. Jacques Vallee is one of ufology's major figures - and also its most original thinker.